It’s 9am on a gloriously sunny Glasgow September morning, but just a few miles from the city in Cumbernauld there’s little time to enjoy the good weather. 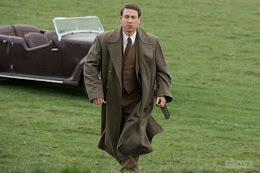 Time travel drama Outlander is well into production on its second series and there’s work to be done. Just a hop skip and a jump from the white tent that’s been erected to keep us writers comfortable, extras and crew are milling around preparing to film another scene in new surroundings. 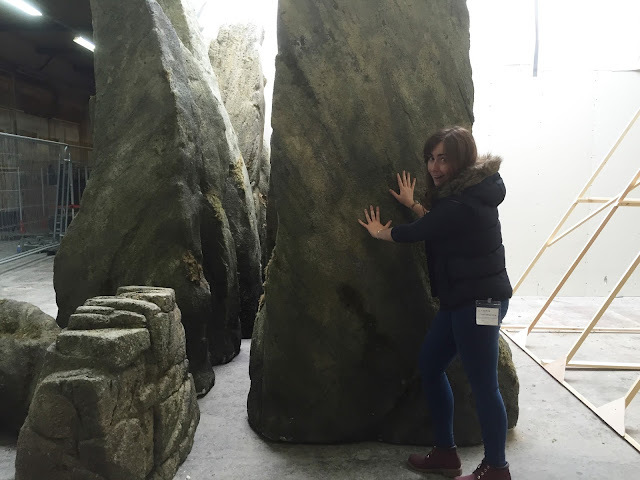 Outlander has moved to Paris, and the joie de vivre on set is evident. 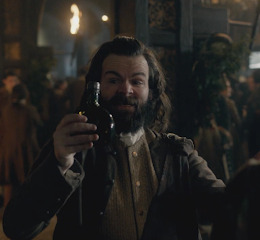 Duncan Lacroix, who plays Murtagh, is first up this morning, slinking into the press tent in costume to have a very quick chat. “What’s the first thing on the agenda? Who are we sacking?” he chuckles, observing the gaggle of journalists gathered around the table, before breaking into a discussion about his character and his co-star Sam Heughan, a man who he says it’s “almost impossible not to get on with”. 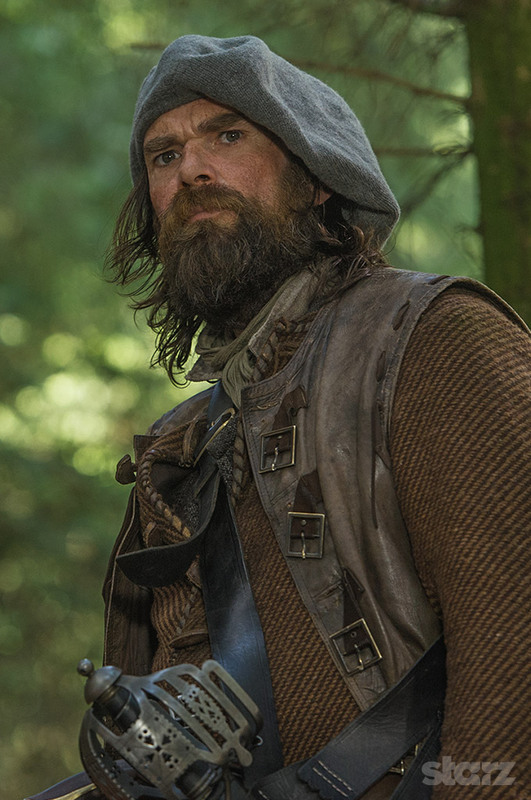 The 45-year-old says he’s adjusting to a new series and a new world, as Jamie, Murtagh and Claire leave those beloved highlands and head over the high seas to France to try and stop the Jacobite Rebellion. The show may have left its Scottish heartland, but that doesn't mean there's any less heart put in to creating the world of Outlander. "The amount of detail they put into the sets in there, it's amazing," says Lacroix. After a lesson in Scottish Gaelic from dialect coach Carol Ann Crawford (we’d be foolish to venture into Outlander territory without learning Jamie’s native tongue) we stroll past those famous standing stones, through a set of bare wood doors and straight into the elegant courtyard of the Frasers’ Parisian love nest – which also doubles as a market square on occasion. “When it’s Jamie and Claire’s apartment it’s filled with floral things and plants,” explains Jon Gary Steele, the show’s production designer. “When it’s a market square we bring in a fountain,” he continues as we walk up a stunning spiral staircase. 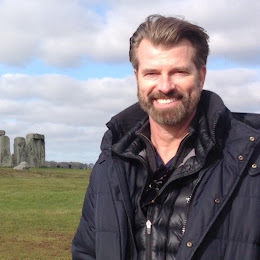 Thanks to some very clever set decoration by Gina Cromwell (who worked on Downton Abbey between 2010 and 2012) the average viewer probably wouldn’t even notice that the same set is serving as multiple locations. Gina is responsible for making sure we never realise Jamie and Claire’s bedroom also serves as the dining room. “We pull the wall panels out and swap it to a different colour because it’s so expensive,” explains Steele. “We have a pink velvet. We use fabric because it’s richer,” Cromwell adds as she guides us through the elaborately decorated room where the show’s leading lad and lass play host to the French aristocracy during an elaborate party scene. It’s also where the French king Louis XV sleeps. 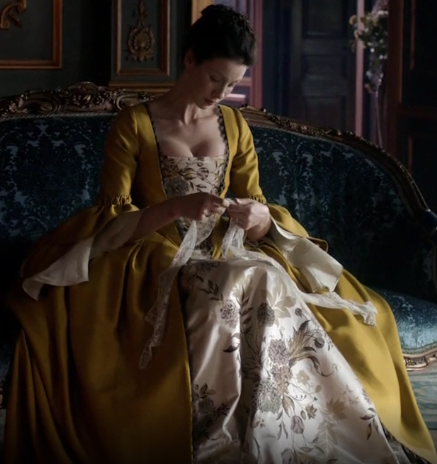 “Gina built this amazing King’s chamber bed,” Steele says, running through a list of alterations – including the addition of printed tapestries modelled on a series hanging in the Louvre – that are made to turn Claire and Jamie’s home into a palace fit for a king. 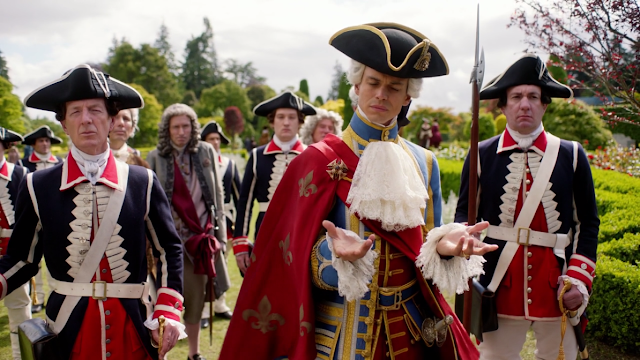 When we meet King Louis XV (actor Lionel Lingelser) it’s in a decidedly less palatial setting though. He’s relaxing in a trailer on set, finishing his lunch with the show's new villain, Le Comte St Germain (aka Stanley Weber), his royal attire hanging on the back of his chair. “I read that he was the most beautiful king,” Lingelser smiles playfully. “I read it.” The French actors are in a jovial mood, with their time on set drawing to a close – for now at least. They’ll be sad to go, though. “On the first day I arrived, the first one I met was Cat. And she came straight over to me and introduced herself,” says Weber. 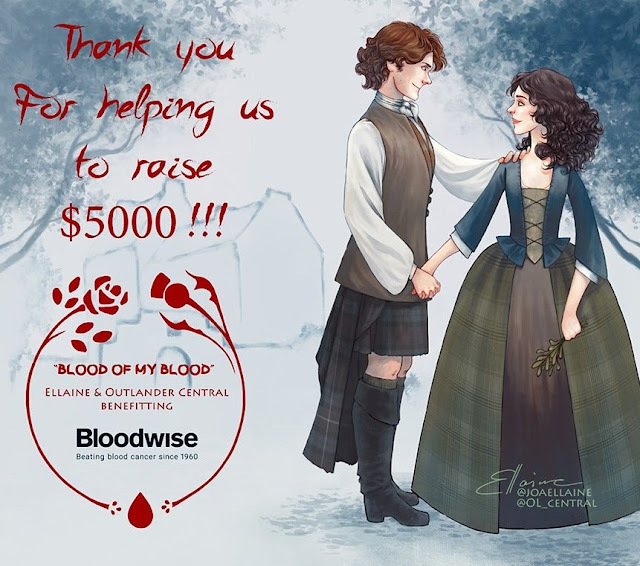 Both men speak highly of Heughan and Balfe, attributing much of the show’s success to the duo’s on-screen chemistry and the emotional nature of Diana Gabaldon’s story. Casting those leads wasn’t the easiest thing to do either, as executive producer Meril Davis explains. 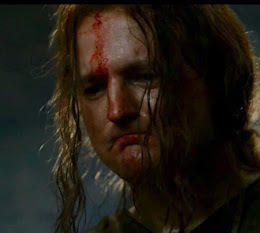 “When we first sat down to cast, [Ronald D Moore] and I said to each other, ‘Jamie is going to be so tough, we’ll never find him’. I said he’d be the UPS guy in Scotland, we’d never find him. And we thought Claire would be very easy, because there’s so many incredible actresses out there for this part. It turned out to be the opposite. 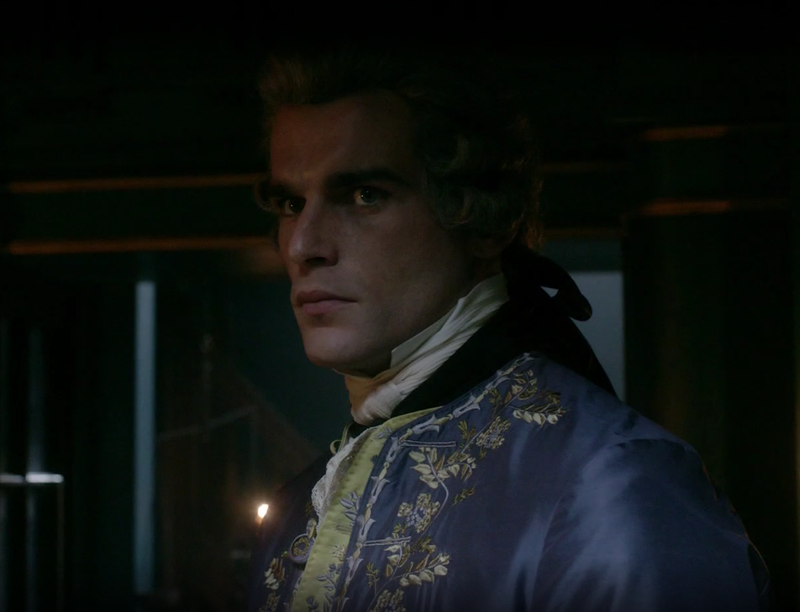 Finding Claire is as difficult for us as it was for Davis and co. The show’s leading lady is in demand, filming back-to-back scenes all day, but her leading man makes an appearance on his day off. Clad in a leather jacket with his hair scraped back from his face, Sam Heughan couldn’t look further from the Highlands – even though they’re only a few miles away. “There’s a LOT of excitement to get back to Scotland,” he smiles, “to the rain and the cold and the mud.” Heughan is proud of the success of the first series, though he seems quite humbled to hear it described as “a hit” by another journalist. “When we go to America and everywhere else, people are very excited about it. 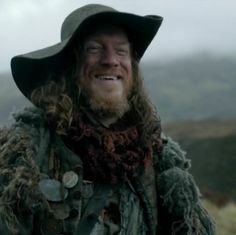 I think it’s a great story, I think that Scotland really shines in the show. 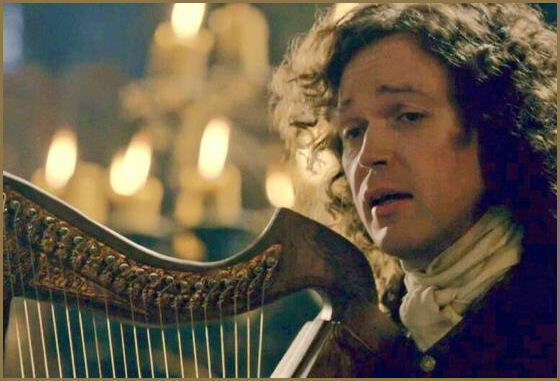 He’s got a real fondness for the Scottish crew, who he says were particularly good fun on location in Salisbury, Wiltshire, where some of the Versailles scenes were filmed. They’re about to pack up in order to finish filming Parisian scenes in Prague, Heughan explains. “It feels sort of like a holiday,” he chuckles. Before they can flee across the continent we finally track down the leading lady, who manages to squeeze both herself and several layers of sumptuous skirts into a chair at the head of the press table. 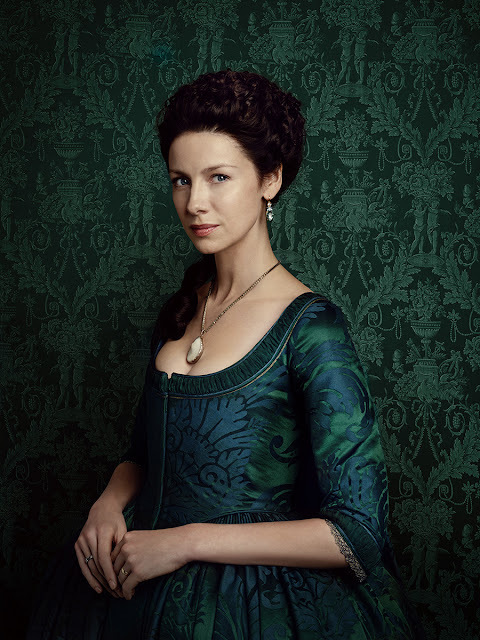 Balfe’s star has skyrocketed since she was cast as Claire Randall Fraser, so what does she attribute the show’s success to? “I think it tackles, in a very large scale, themes a lot of people can relate to. 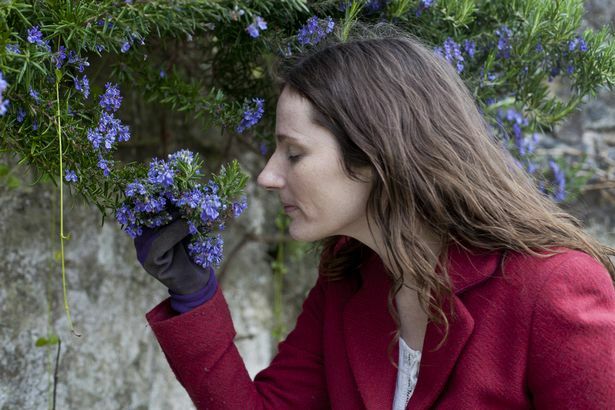 There’s the search for a home, both physical and emotional,” she explains. “There’s the theme of love and trying to work through a marriage. 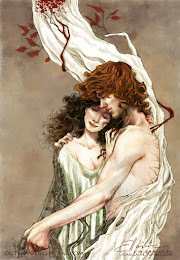 From day one Jamie and Claire begin with a marriage. And I think displacement: Diana says a lot of her readers are people who are in the army and who have to experience these long distances, either their husband or wife going off." And when social media sites allow those fans to come together, in enormous numbers, does that make a difference? “It’s not even a question,’ says Davis. “I never had a Twitter account; I got one right before the show. I think it’s a completely new different landscape. The giant silver TV Champion trophy clinking around in the bag I’ve been carrying all day is testament to that. 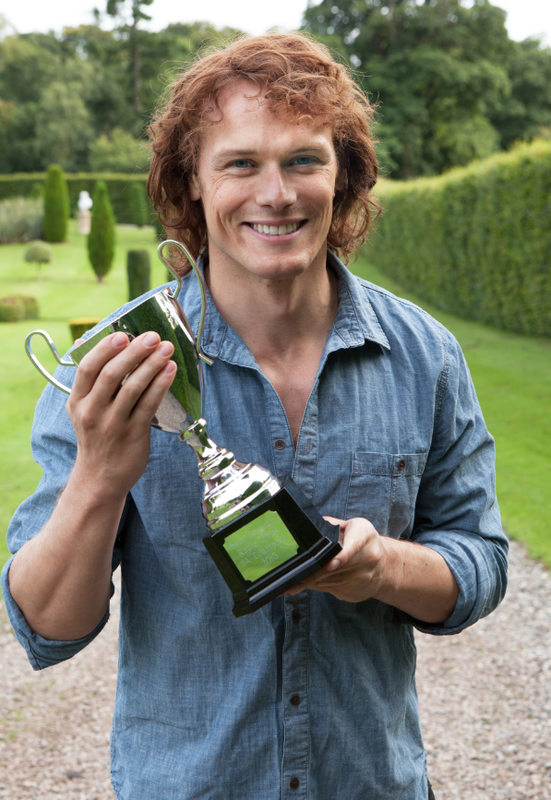 16 episodes were enough to inspire fans to cast millions of votes to secure Heughan’s victory in the 2015 Radio Times TV Champion tournament. Who knows what Outlander will achieve after another 13 episodes air?